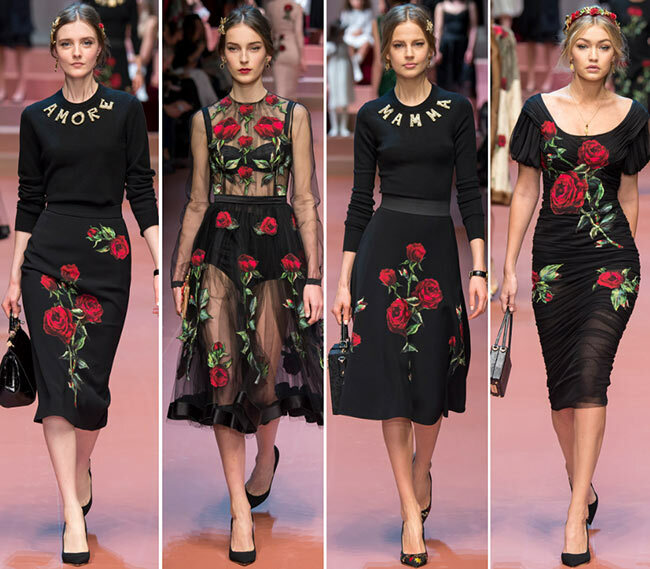 Domenico Dolce and Stefano Gabbana are two genius minds, who manage to give us freedom in our fashion fantasies and always make our dreams come true every time they present a new collection. 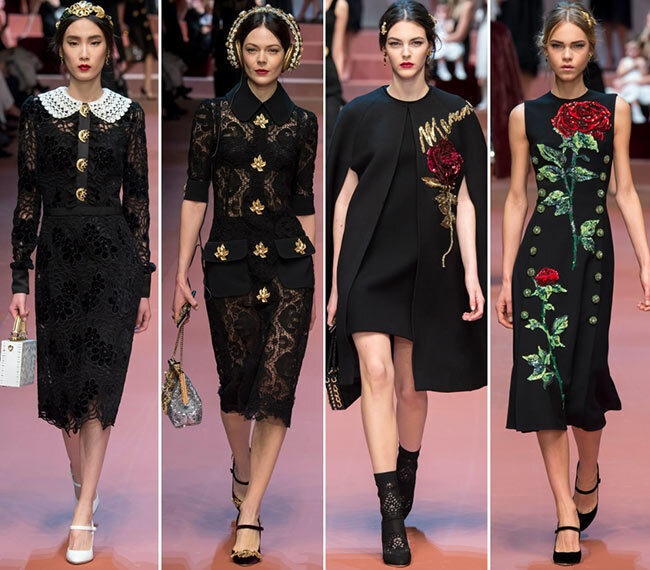 They know how to worship a woman with their exquisite creations embedded with a high dose of glamour and luxury even when it’s a simple little black dress. 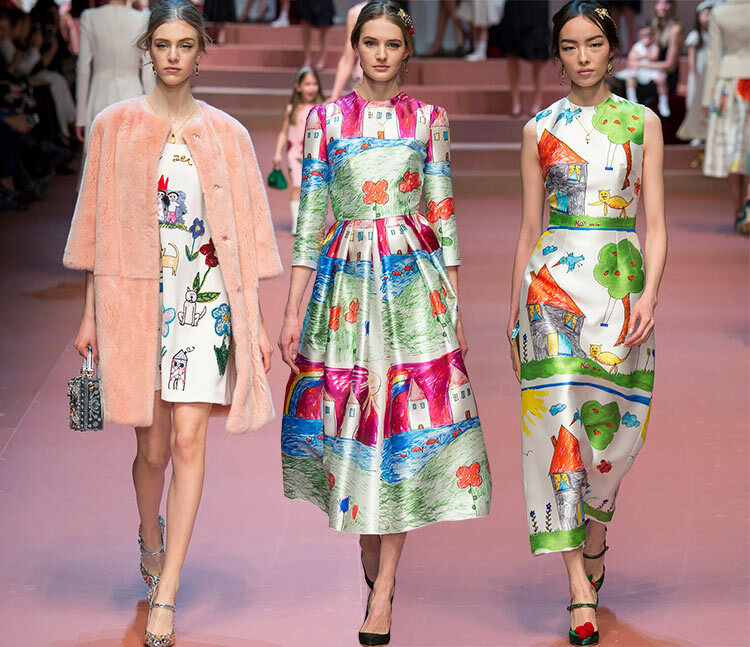 They are unbeatable when it comes to depicting history, culture, family and love in their designs, playing with details and never shying away from opulent embellishments, which has shaped the DNA of their luxury fashion house. 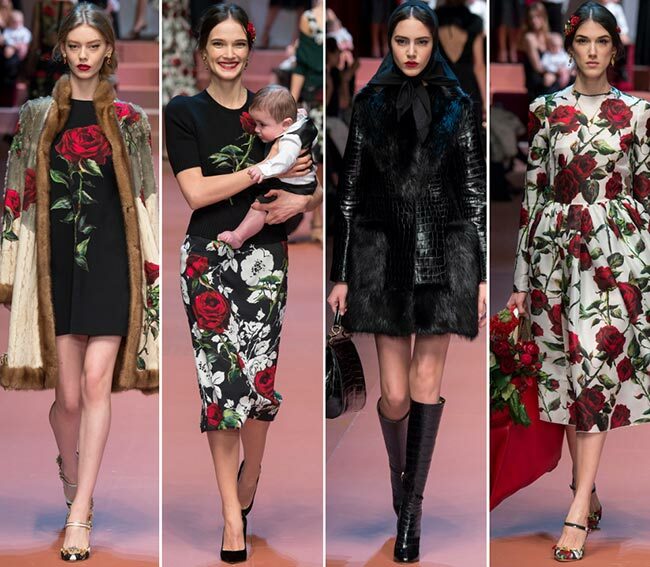 Titled Viva la Mamma and using the hashtag #DGMamma, their Dolce & Gabbana fall/winter 2015-2016 collection celebrates motherhood right in time for the International Women’s Day later on March 8. 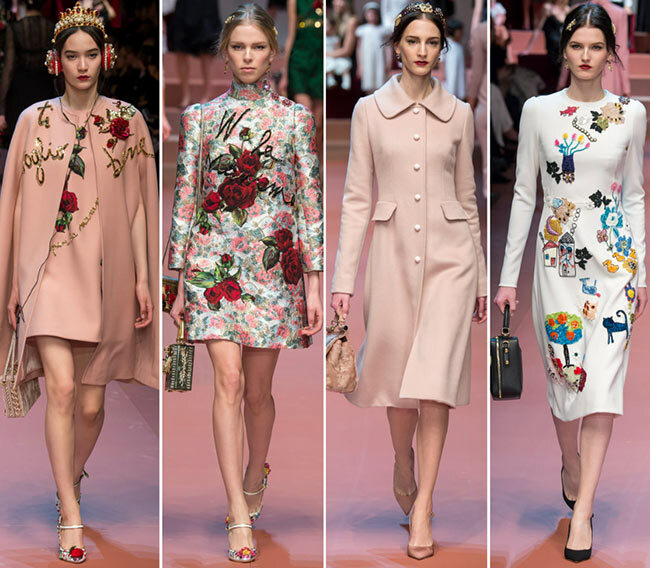 Beautiful “mammas’ walked down the runway carrying babies or holding hands with their daughters, while pregnant beauty Bianca Balti looked absolutely radiant in a simplistic below-the-knee dusty pink sheath dress complemented with a vintage style Dolce & Gabbana black handbag and a pair of heeled shoes. 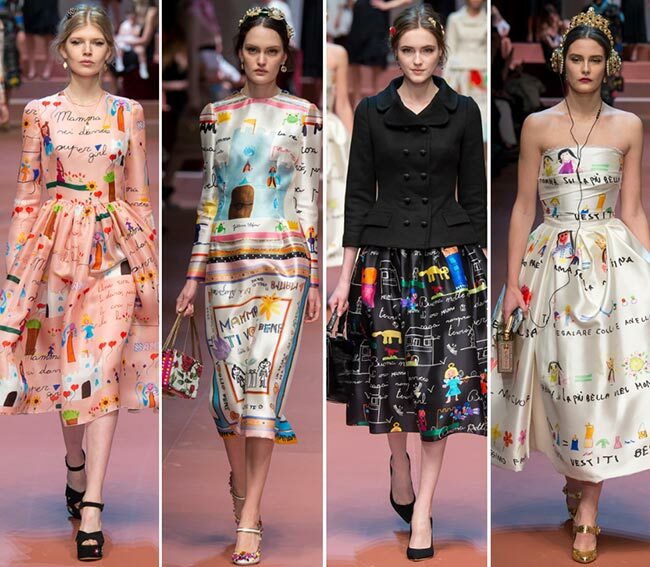 And the backdrop? 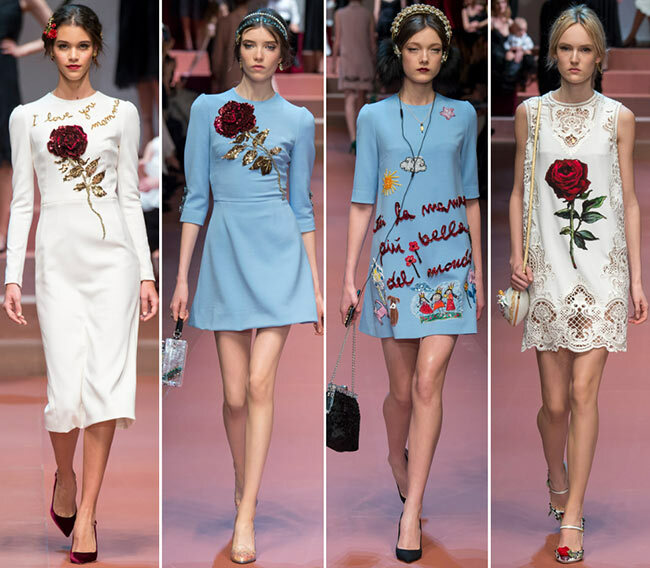 Beautiful moms and lots of kids dressed in lovely Dolce & Gabbana dresses! Couldn’t be any cuter and more creative! 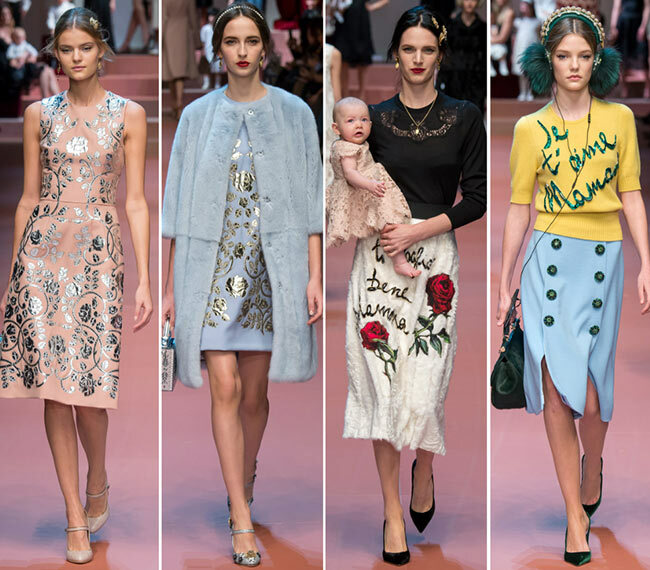 It’s a devastatingly beautiful and dreamy collection that pays tribute to all the mothers in the world, their elegance, grace and beauty through mind-blowing dresses adorned with oh-so-cute kid scribbles (you remember Angelina Jolie’s wedding veil, don’t you?). 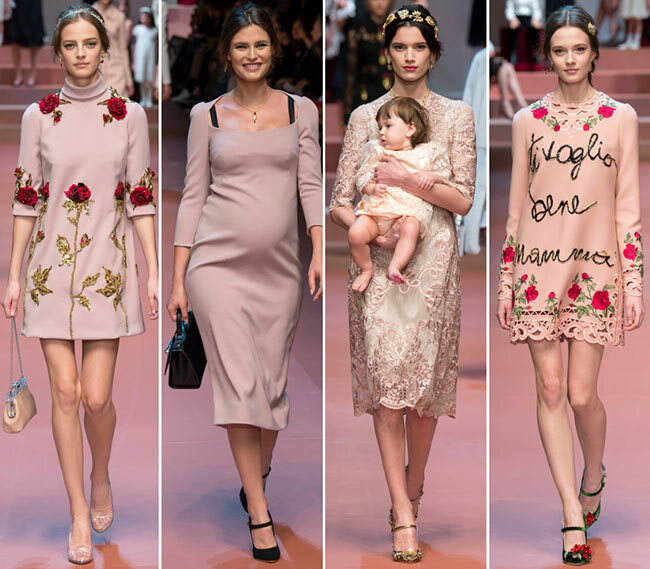 The maternal mood started in the very beginning of the show, when the guests were given Edoardo Bennato’s Hurray for Mum translated in 15 languages and when the first model walked down that dusty pink catwalk wearing a simplistic below-the-knee white dress with the pretty rose appliqué and the message reading “I love you mamma’. 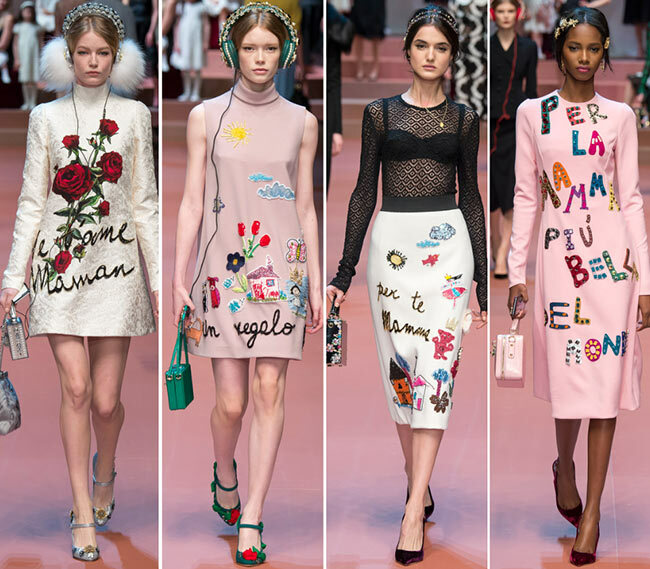 We saw the same message in Italian too (“ti voglio bene mamma’) appearing on dresses, skirts, sweaters and even coats and looking so charming that our hearts literally melted at the sight of those designs. 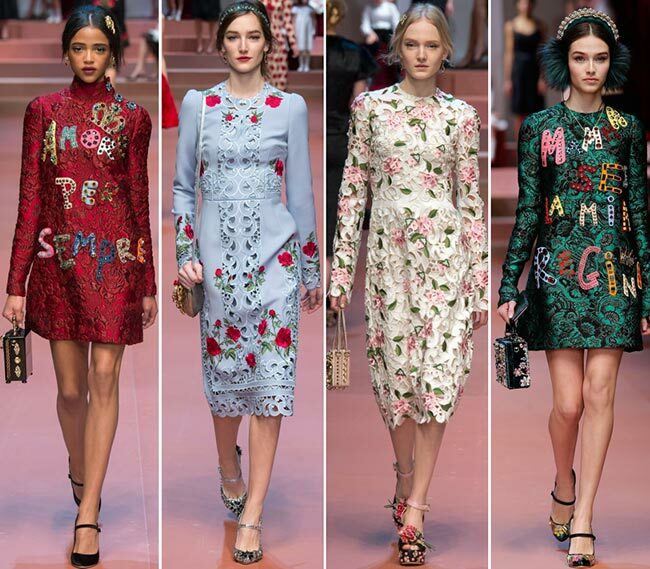 And even when we didn’t see such messages, we were overwhelmed by the abundance of childhood Crayola drawings and the passionate red rose motifs coming in the forms of prints, embroideries and appliqués to turn each and every piece into a real work of art. 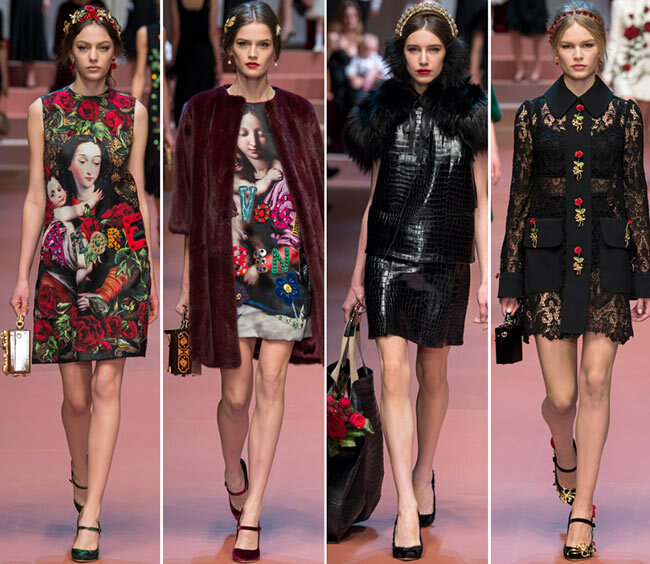 From the color palette used to their signature Sicilian lace, as well as the perfectly tailored Forties skirt suits and Fifties hourglass dresses, every aspect of the Dolce & Gabbana fall/winter 2015-2016 collection pleased our senses to bits, making us fall in love with the philosophy of the fashion house over and over again. 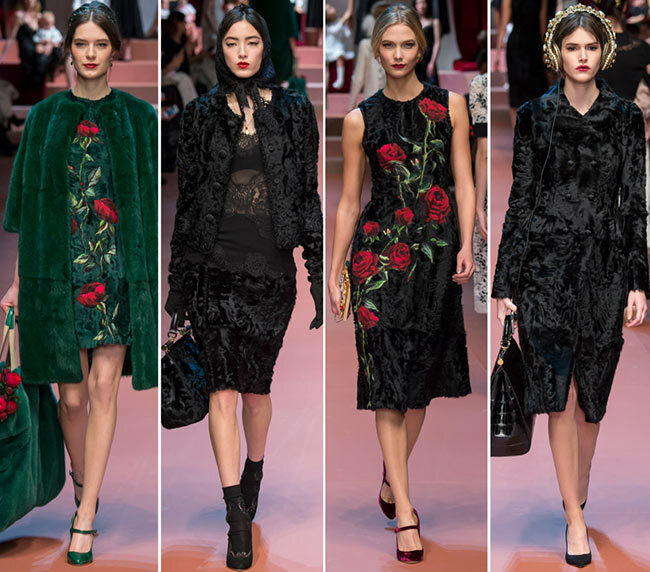 We could hardly take our eyes off those simplistic black numbers, including the sensual guipure lace designs, while the little dresses in pastel colors and with oversized rose detailing become must-have pieces for our fall wardrobes for when it comes to creating effortlessly chic and girly looks. 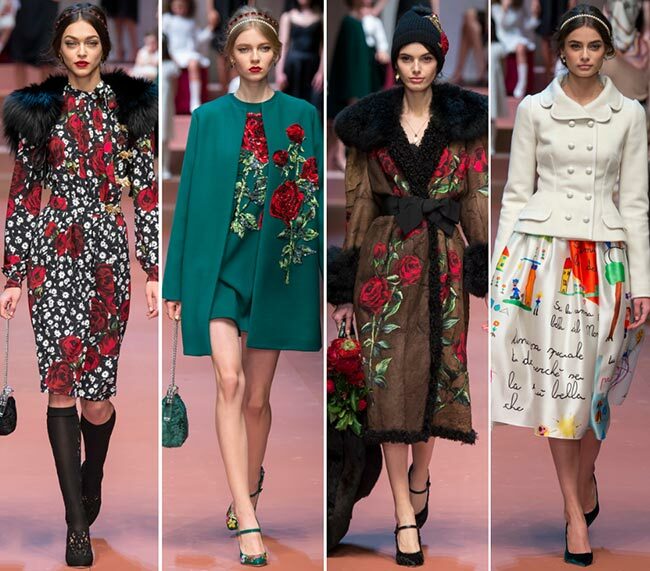 There were even elaborate prints featuring the Madonna with her child that instantly took our breath away, while the fur coats coming in different shades and the black reptile skin coat with fur trimmings are the go-to outerwear options for elevating your winter looks and injecting a big dose of luxury to your day-to-day and special occasion outfits.